Skill Level 3. Previous experience recommended. This model builds into a 1:350 scale replica of the Giant. The completed model is approximately 13 inches long. giant_instr.pdf - 238 KiB - This document contains the instructions only (4 pages). giant_parts.pdf - 1.55 MiB - This document contains the parts layout (4 pages). Compared to other European powers, Russia was relatively late entering the field of lighter-than-air craft. However in the first years of the 20th century the military recognized the potential of airships, and over the next decade Russia was to acquire 20 of various types. Though many ships were purchased from other countries, over time Russian engineers began experimenting with their own designs. The largest of these was a semi-rigid ship appropriately called Giant. The ship as originally designed was 114 m long, with a diameter of 17 m and four 215 horsepower engines. It was intended to fly up to 2500 m altitude, carrying 9000 kg for 20 hours. During construction the number of engines was reduced to two, placed in the middle of the ship. The end of Giant's only flight. The first flight occurred on February 10, 1915, but after half an hour aloft the airship sagged in the centre, weighed down by the re-positioned engines. With its keel broken, the damaged Giant dropped gently into a forest and the crew escaped with no injuries. 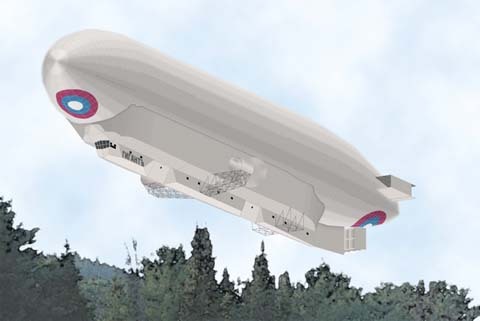 Although the ship was rebuilt, the success of the aeroplane bomber had made military airships largely obsolete and the Giant was scrapped in 1916. 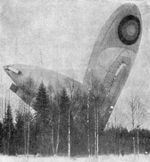 Dirigibles of Imperial Russia - photos and information about Russia's early airships. This is a Russian language site.